› Author AffiliationsWe thank the Council of Scientific and Industrial Research (CSIR), New Delhi [02(0272)/16/EMRII] and the Department of Science and Technology (DST), New Delhi (EMR/2015/002053, SR/S2/JCB-33/2010) for financial support. S.K. thanks the Department of Science and Technology (DST) for the award of a J. C. Bose fellowship (SR/S2/JCB-33/2010) and Praj Industries, Pune for the Pramod Chaudhari Chair Professorship (Green Chemistry). We have summarized diverse synthetic approaches for the modification of peptides by employing transition-metal-catalyzed reactions. 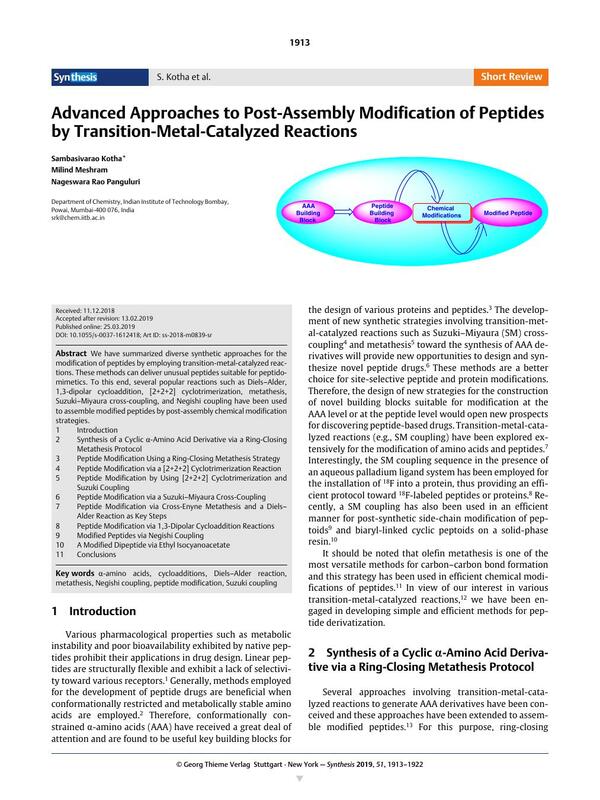 These methods can deliver unusual peptides suitable for peptidomimetics. To this end, several popular reactions such as Diels–Alder, 1,3-dipolar cycloaddition, [2+2+2] cyclotrimerization, metathesis, Suzuki­–Miyaura cross-coupling, and Negishi coupling have been used to assemble modified peptides by post-assembly chemical modification strategies.